Take me out to the ball game! If you are anything like us, then you love visiting the country’s most historic and impressive Ballparks to enjoy America’s favorite pastime…Baseball. That’s why we created our Baseball Adventures Map, so you can track all of the baseball stadiums you have visited on your quest to see them all. Our Major League Baseball Stadium Pin Map has all the American League and National League teams’ stadiums in the US and Canada listed and plotted on the map. Once you visit a ballpark, use one of our handy baseball stickers that say “BEEN HERE” and put them in the glove over the ballpark you visited and see if you can “catch” all of the Majors! We also include 100 pins with your order so you can use your baseball push pin map to track your non baseball travels as well! Our map of baseball stadiums lists all 30 MLB team names sorted by division, stadium names and also stadium capacity in the lower left portion of the map. Your Baseball Adventures Map can even be personalized with your name, favorite quote, or whatever you want to make it even more unique and personal. This Baseball Stadium Map makes the perfect gift for the baseball enthusiast in your life and is also a great gift for children who are just starting out on their lifelong love of the game. If you choose to add the personalized plaque, the white plaque will be placed over where it says “Catching the Majors” at the bottom of the map. Please see the listing for a close up. If you prefer the plaque to be in a different location, please just let us know by leaving a note during checkout. Play ball! We also offer a premium canvas Baseball Map of the United States! Want to give your Baseball Adventures map that extra special touch? Customize it with a personalized plaque to make it your own and create a unique way to capture your memories. The plaque will be placed over where it says “Catching the Majors” at the bottom of the map. If you prefer the plaque to be in a different location, please just let us know by leaving a note during checkout. Need some inspiration for what to put on your plaque? Feel free to check out our personalization ideas for some of our more popular quotes and sayings. Plaques may contain up to 3 lines of text with a maximum of 25 characters per line. Please contact us if you have something special in mind that is slightly longer, and we will see what we can do! Each Baseball Adventures map comes with a set of 30 “BEEN HERE” baseball stickers to put in the gloves of the stadiums you have visited to signify that you have “caught” that stadium. 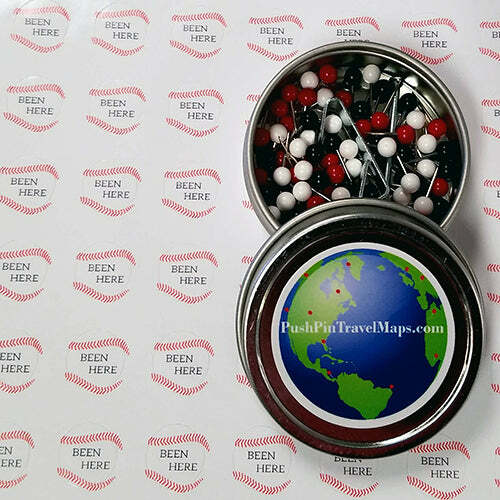 Our baseball stadium map also comes with 100 pins in a mixture of red, white and black so you can pin your other travels across the continental United States. Need more than 100 map pins? Additional map pins, in a variety of colors can be purchased here (Map Pins). Bought the Baseball Adventures Push Pin Travel Map for my husband's birthday and was blown away by the quality and prompt delivery. He has made everyone in his fantasy baseball draft jealous! :P Would definitely recommend! I have ordered several travel maps for friends, and I am so excited to get one of my own! The quality is amazing and I always get great customer service from them. Looks great, only suggest is to have the pins be bigger and maybe have flags on them to put the date that you went or the score. Otherwise I love it!